Before we went to Sri Lanka I couldn’t have imagined eating curry every day and still enjoying it. Whilst I love a good curry, it’s not something I would usually want on repeat every day. The curries I tried in Sri Lanka completely changed my opinion. There, curry is something completely different. Less saucy and smaller portions, I was blown away with the vast selection and varieties of curries to choose from, so much so that I ended up having it nearly every night. In Sri Lanka, when you order their staple dish – rice and curry – it comes with a huge plate of rice and between 6 and 10 different small curries. Most of these are vegetarian with the odd fish or chicken dish. It’s impossible to get bored of this food when every day you are presented with a new curried vegetable dish. 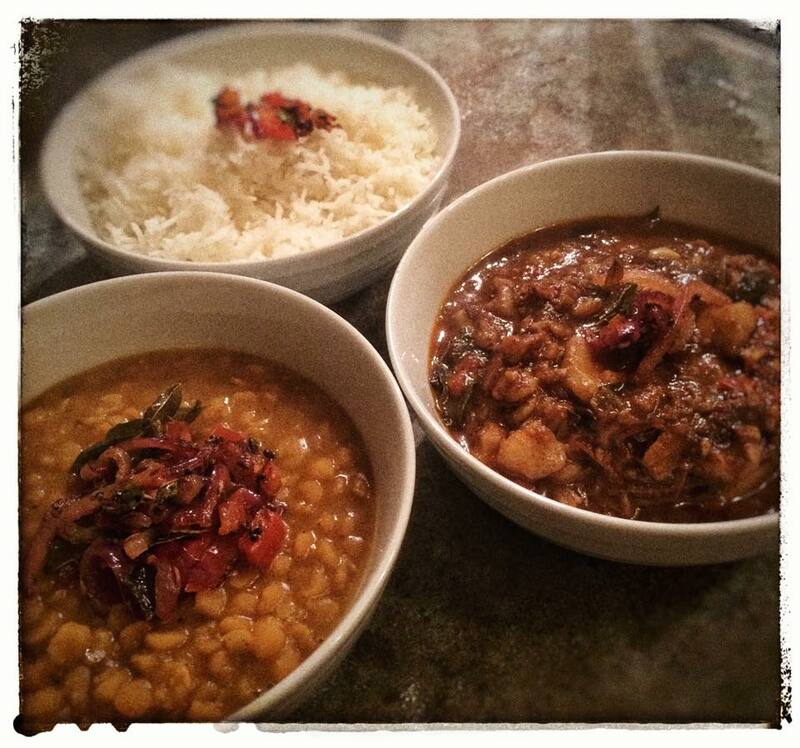 Of all the vegetarian curries I tried, my favourite was the lentil dhal. I just couldn’t get enough of the stuff so I knew that when I got home, it would be one of the first things I would be cooking up in my kitchen. I’m told that no two people ever cook dhal the same so it was really difficult to pin someone down for one specific recipe. This recipe is therefore a bit of a mix of those I was told about. It is really delicious and something which I will be making regularly. You can have it on its own with rice or a roti or, do as the Sri Lankans do and make a few little curries and have a variety. I made a simple fish curry to go with this and the flavours complemented each other perfectly. Rinse the lentils in two changes of water, drain and then pop into a small pan. Add the salt, turmeric and roasted curry powder (if using), add 250ml water and bring to the boil. Turn the heat down, stir and simmer for around 10 minutes until the lentils are just cooked but have not lost their shape completely. Add the coconut milk and sugar and simmer for another few minutes. Whilst the lentils are bubbling away you can get on with making the ‘temper’ for the top. Spray a frying pan with coconut one kal spray. Add 1 tsp olive oil and heat. Add the mustard seeds and when they start to pop a little, add the cumin seeds. Next add the onion, curry leaves, garlic and chilli and cook for another few minutes until the onion starts to soften. Finally add the tomato and cook for another 2 minutes. Once the lentils are cooked, pop into a bowl and top with the temper. Alternatively you can mix the temper through the lentils. Very tasty, would do again, and my teenage daughter loved it. Had this with the Sri Lankan fish curry. Great accompaniment. Very tasty. I hve recently discoverd your website and amplanning to make lots of the recipes. Tongight is this one, and if it helps, i have pointed it on the new Flex system and it’s 4 for the recipe or 1 per portio (for 3 or 6). Licked the plate clean. Absolutely loved it!